The voting may be over, but your election chores are not finished: You’ve got work to do. Energize your teams to go out and pick up all stuff you put throughout the community. Do a thorough search …. 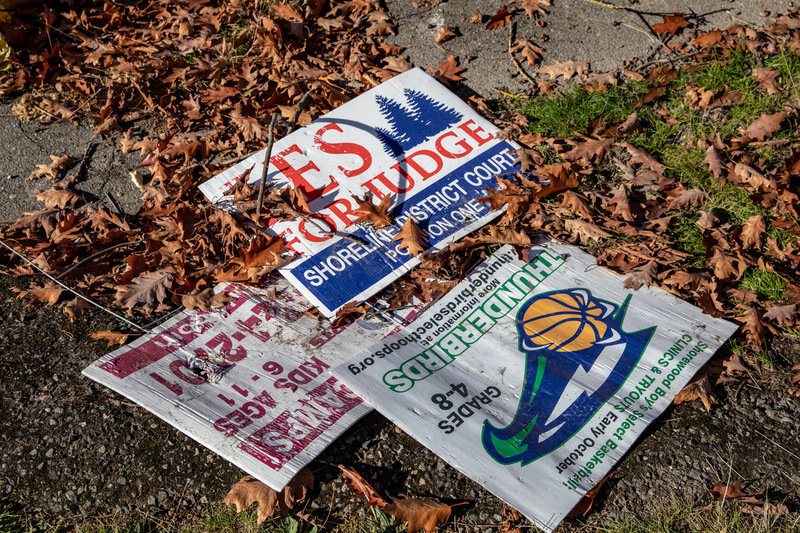 don’t simply get the obvious signs … there are plenty of others that have been pushed down and are now part of street and sidewalk debris that so badly needs to be cleaned up by property owners and the city. While you’re out there, do us all another favor and collect those pro/con sidewalk issue and initiative signs. You’ve sought our votes by trying to convince us you care --- follow up with some action to prove it! Larry -- Thanks for your letter. I've been involved with the Yes on Prop 1 campaign, and we definitely want to pick up our signs. Many have been pushed down or blown from their original positions, but I agree they need to be cleaned up. They can't be seen while driving around, so we need your help. Anyone -- If you see a sign for Shoreline Prop 1 (pro or con), please call and leave a message for me at 206/200-2086 with the location (please be as specific as you can). I'll send someone out to pick it up as soon as possible. Thank you for the reminder about picking up signs! The picture of the signs included one from T Birds Boys Select Basketball. We have a schedule for placement and removal of our signs each year. We ask our volunteers to keep track of where signs are placed so that they can be removed. Each year, a few disappear from where they were placed. We certainly want to get each of them back.